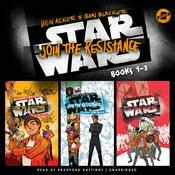 Join the Resistance (Book 1) IF BEING A HERO WERE EASY, EVERYBODY WOULD BE ONE. MATTIS BANZ knows that he’s meant to be a hero of the galaxy like the legendary Luke Skywalker, and when General Leia Organa’s Resistance recruits him to join its efforts against the evil First Order, he finally has a chance to fulfill his destiny. But the rest of his squadron doesn’t seem very promising. Sure, there’s the Zeltron girl Lorica, famous for her exploits foiling evil smugglers, but there’s also the swamp boy named Dec, who seems to enjoy causing trouble; Dec’s “brother,” a droid who thinks he’s a pilot; Sari, whose imposing size contradicts her sweet nature; and Jo, the stuffy group leader with secrets. How is Mattis supposed to be the next Poe Dameron when he and his squad mates spend more time in trouble than flying X-wings? The team will have to learn how to work together when the going gets tough, or they won’t be going anywhere … Join the Resistance: Escape from Vodran (Book 2) SOMETIMES THE HERO YOU WANT TO BE ISN’T THE HERO YOU NEED TO BE. From the moment they landed on the swampy planet Vodran, J-Squadron’s mission for Admiral Ackbar has been a disaster—and now Mattis, Lorica, AG-90, and Jo have been captured by the First Order! Can things get any worse? Of course they can: Jo immediately turns traitor and abandons his Resistance squad mates, and AG is taken away to be reprogrammed as a villainous First Order droid. Forced to rely on each other, can the squabbling Mattis and Lorica work together to escape before they are forced to give up Resistance secrets? Meanwhile, Dec and Sari land on a mysterious moon and encounter unexpected inhabitants: a group of outspoken droids and the infamous Harra the Hutt. Harra might be able to help Dec and Sari save their friends, but bargaining with a Hutt rarely goes as planned. These wannabe Resistance heroes will need quick thinking and even quicker moves if they are going to survive! 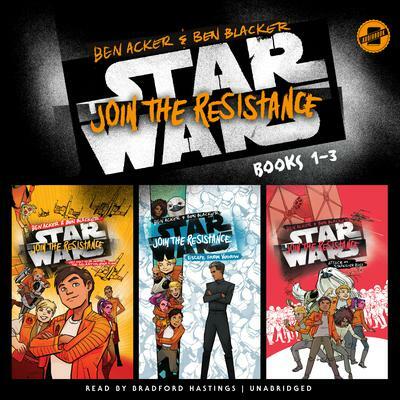 Join the Resistance: Attack on Starkiller Base (Book 3) IF YOU WANT TO BE A HERO … TRY BEING A FRIEND FIRST. J-Squadron would be flying away from a First Order ship, not toward one. But this ship has their friend and squad mate Jo Jerjerrod aboard as a prisoner, and J-Squadron won’t stop until Jo is safely back with the Resistance. Their pursuit takes them to Starkiller Base, a planet that has been turned into a headquarters for the First Order—and a weapon capable of destroying entire star systems. Mattis and his friends need to rescue Jo and get off-planet as fast as they can so they can warn the Resistance about the secret base … but will they be able to stop squabbling among themselves? If there was ever a time for the members of J-Squadron to step up and become heroes, this is it! IF BEING A HERO WERE EASY, EVERYBODY WOULD BE ONE. SOMETIMES THE HERO YOU WANT TO BE ISN’T THE HERO YOU NEED TO BE. From the moment they landed on the swampy planet Vodran, J-Squadron’s mission for Admiral Ackbar has been a disaster—and now Mattis, Lorica, AG-90, and Jo have been captured by the First Order! Can things get any worse? Of course they can: Jo immediately turns traitor and abandons his Resistance squad mates, and AG is taken away to be reprogrammed as a villainous First Order droid. Forced to rely on each other, can the squabbling Mattis and Lorica work together to escape before they are forced to give up Resistance secrets? Meanwhile, Dec and Sari land on a mysterious moon and encounter unexpected inhabitants: a group of outspoken droids and the infamous Harra the Hutt. Harra might be able to help Dec and Sari save their friends, but bargaining with a Hutt rarely goes as planned. These wannabe Resistance heroes will need quick thinking and even quicker moves if they are going to survive! IF YOU WANT TO BE A HERO … TRY BEING A FRIEND FIRST. J-Squadron would be flying away from a First Order ship, not toward one. But this ship has their friend and squad mate Jo Jerjerrod aboard as a prisoner, and J-Squadron won’t stop until Jo is safely back with the Resistance. Their pursuit takes them to Starkiller Base, a planet that has been turned into a headquarters for the First Order—and a weapon capable of destroying entire star systems. Mattis and his friends need to rescue Jo and get off-planet as fast as they can so they can warn the Resistance about the secret base … but will they be able to stop squabbling among themselves? If there was ever a time for the members of J-Squadron to step up and become heroes, this is it! Ben Acker and Ben Blacker are the creators and writers and producers of the Thrilling Adventure Hour, a staged show in the style of old-time radio, and which is also a podcast on the Nerdist network. In television, they have written for the CW’s Supernatural, Dreamworks/Netflix’s The Adventures of Puss in Boots, and FX’s Cassius and Clay. They’ve also developed original pilots for Fox, USA, Spike, Paramount, Nickelodeon, and others. In comics, they’ve written for Marvel, Dynamite, Boom!, and others. Acker has written for Public Radio International’s Wits. Blacker is the creator and host of The Writers Panel, a podcast about the business and process of writing, as well as its spin-off, the Nerdist Comics Panel. He’s the producer of Dead Pilots Society, a podcast in which unproduced television pilots by established writers are given the table reads they so richly deserve.